I am sitting in a Barnes and Noble in Sioux Falls, South Dakota and I have been rushing around all day. My WiFi card is not working here. I went to a Starbucks that didn’t have their WiFi working. So, I drove across town to another Starbucks, but it was being remodeled and only the drive through was open. I did an interview at 2:30 at “The Birdcage”, where the Canaries play in the American Association baseball league, then found a Planet Fitness so I could take a shower. I will be on the radio broadcast tonight at the game. My schedule has been quite busy with a lot of media requests. I appreciate all of the TV Stations and Newspapers that have taken an interest. I was in Willmar, Minnesota last night at a Northwoods League game between the Willmar Stingers and the Duluth Huskies. It was one of those games where I just wanted to keep to myself. I got a lot of looks from people since Willmar is a smaller town, about 20,000 population, about two hours from Minneapolis and three hours from Sioux Falls with not very much in between. I was asked a few times if I was a scout, a couple times if I was a reporter. I smiled when asked if I was a scout. I secretly wanted to say that I was but with my non-verbal smile, I gave the impression that I was. Why I do that I will never know. Why do I think being a scout is so cool? I know, it is a lot of time on the road. I said that I was a writer when asked if I was a journalist, I didn’t feel I was stretching the truth since I do post on my blog everyday. 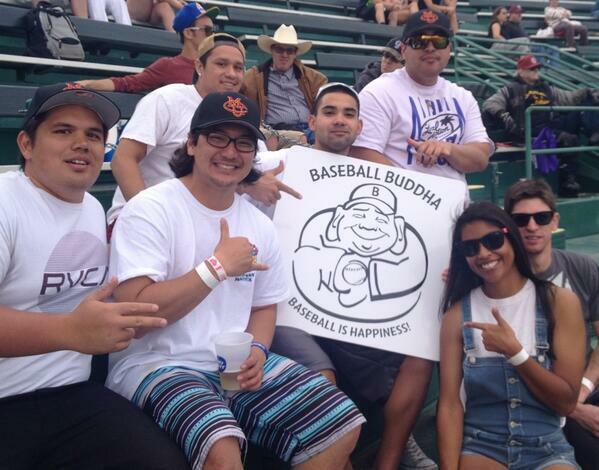 But, I gave the impression that I worked for someone bigger than BaseballBuddha.com. Again, I can’t explain it. I was enjoying the looks and the whispers I would get from people. When I would ask a question, people answered very politely. I know they wanted more information about me; however, I was in one of those moods where I didn’t feel like talking too much (hard to believe I know). The game was a good one and I took a lot of notes for future reference. Some games I take tons of notes and do nothing with them. I always think that if I were to write a book about this experience, I will at least have a very full journal of notes I have taken for a piece that I want to create; or, this vision I have for a chapter. We will see if it ever comes to fruition. Anyway, I have to get moving, the game starts in a little bit but I wanted to get something out today even if it was a quick recap. Chad, my brother, keeps encouraging me to dig deep and to make sure to put something out everyday. I am still enjoying everyday. My buddy, Paul, has told me that I am the second luckiest guy in the world (if you are a baseball fan you know who the first is), I believe that I am.